Russian Foreign Minister Sergei Lavrov Friday slammed US threats to strike Syria as "unacceptable." "The threats to carry out unilateral military strikes on Syria, including Damascus, recently voiced by the United States, as it was last April based on unsubstantiated accusations against the Syrian government of using chemical weapons, are unacceptable and inadmissible. [We] have clearly said that to US representatives via diplomatic and military channels," Lavrov told reporters. Earlier this week, US Envoy to UN Nikky Haley threatened a Washington strike against Damascus in the event of chemical weapons being used in Syria. Responding to Haley's statement, the Russian General Staff said that Moscow's armed forces would respond if the lives of Russian servicemen in Syria were threatened, including in the event of a missile strike on Damascus. Lavrov reiterated Friday the need to distinguish terrorists in Syria from the opposition, urging the United States to fight against terrorists in the besieged enclave of Eastern Ghouta. "I hope that the US-led coalition realizes the necessity of not fencing off terrorists, as is happening now in Eastern Ghouta, but will fight terrorist groups consistently and on principle," Lavrov said. The minister stated that the progress achieved at the Astana talks on the Syrian settlement, including due to Russia’s efforts, was not being welcomed by those striving to divide the country into small territories under their control. “Those who, in violation of all norms of international law, in violation of Resolution 2254, obviously seek to divide Syria, to replace the regime so that this important Middle Eastern country is replaced by small principalities, controlled by external players, certainly do not welcome what we are doing in Astana, we are trying to achieve in Astana,” Lavrov said in a welcoming speech before the talks with his Iranian and Turkish counterparts in Astana. Eastern Ghouta has been under the control of terrorists since 2012, with some 10,000-12,000 militants controlling the district, according to Syrian Army's estimates. 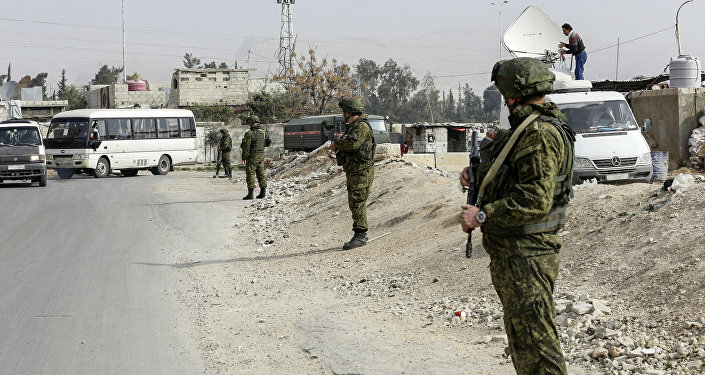 The situation in the militant-held region escalated last month after government forces launched an operation dubbed "Damascus Steel," in a bid to clear the region of militants. Following the escalation, the UNSC unanimously approved Resolution 2401, which provides for the introduction of a ceasefire regime throughout Syria for a period of 30 days. While speaking about the recent comments of UK Defense Minister Gavin Williamson on the expulsion of 23 Russian diplomats from the UK, Lavrov noted that Russia didn't pay attention to statements like that. "He is a nice man and may want to go down in history by his loud statements. He may also lack education," Lavrov stated. The day before, while speaking in Bristol about the expulsion of 23 Russian diplomats from the UK, the British Defense Minister recommended Russia to "go away" and "shut up." Commenting on Williamson's tough statement, Russian Foreign Ministry spokesperson Maria Zakharova said that Britain's partners were worried and London had things to hide.